Formou-se como bailarina na Academia Vaganova de Leninegrado (aluna da professora Balabina), em 1965. Foi bailarina do Teatro Académico de Ópera e Ballet, Mussorgsky, em S. Petersburgo, de 1965 a 1985, onde interpretou papeís de solista em bailados tais como “O lago dos cisnes”, “A bela adormecida”,” Giselle”,” Bayadére”, Sylphide” e “Danúbio Azul”. Foi assistente da professora N. Kurgapkina, na Academia Vaganova, de 1980 a 1990. Foi mestre de bailado principal das Academias Goh e Delta, em Vancouver, Canadá (1991). “Fioraki Ballet school”, na Grécia (1994-96), “ Dolgushin Ballet School, em S. Petersburgo (1992- 4 e 97 to 99), “Lan Yang Dancers”, em Taipé, Taiwan (1991 -2001), mestre de bailado da ” Universal Ballet Company”, Seoul, Korea. (2004-2006) e Consultora da “Russian Ballet” Company, St.-Petersburgo, Rússia (2001-2004; 2006-2012). Foi Mestre de Bailado convidada no Taetro Nacional de Belgrado, na Sérbia (2004 até à atualidade) e lecionou seminários em diversos países: Suécia, Canadá, Coreia do Sul, Grécia, EUA, China e Portugal, entre outros. She graduated in 1965 as a dancer from the Vaganova Academy in S. Petersburg (class Balabina) and she was a dancer of the State Academic Opera Ballet named after Mussorgsky from 1965 to 1985, where she performed solo parts in “ Swan Lake”,”Sleeping beauty”, “Giselle”,” Bayadère”,”Sylphide”, “ Blue Danube” among others She worked at the Vaganova Academy from 1980 to 1990 as assistant of N. Kurgapkina. She has been the principal Ballet mistress at the Goh Ballet Academy and Delta Academy Ballet school, in Vancouver, Canada (1991), the Fioraki Ballet school, in Greece (1994 to 1996), the Dolgushin Ballet school, in S. Petersburg (1992 to 94 and 97 to 99), the Lan Yang Dancers, in Taipei, taiwan (1991 to 2001), ballet mistress of the Universal Ballet Company, Seoul, Korea. (2004-2006) and Consultant of “Russian Ballet” Company, St.-Petersburg, Russia (2001-2004; 2006-2012). 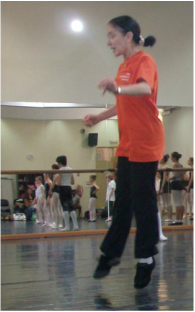 She has been also guest ballet mistress in Belgrad National Theatre, Serbia (2004 till present) and was a teacher of many international ballet seminars in different countries such as Sweden, Canada, Korea, Greece, USA, China, Portugal among others.